Size: 31.8 x 47.8 cms. 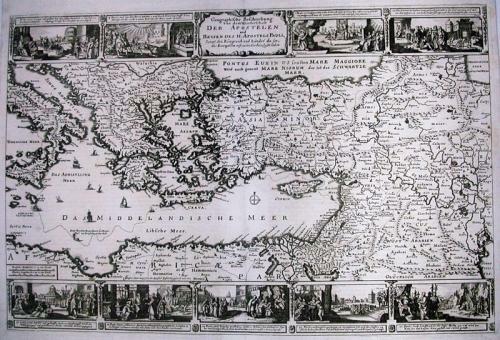 This antique map is almost exactly the same as N Vischer's map from c. 1657 (see Poortman #123) but with German text and omitting the author's and engraver's names. Along the top and bottom are nine illustrations showing scenes from the travels of St. Paul. The route of St.Paul's voyage from Palestine to Rome is also shown. German text on verso.